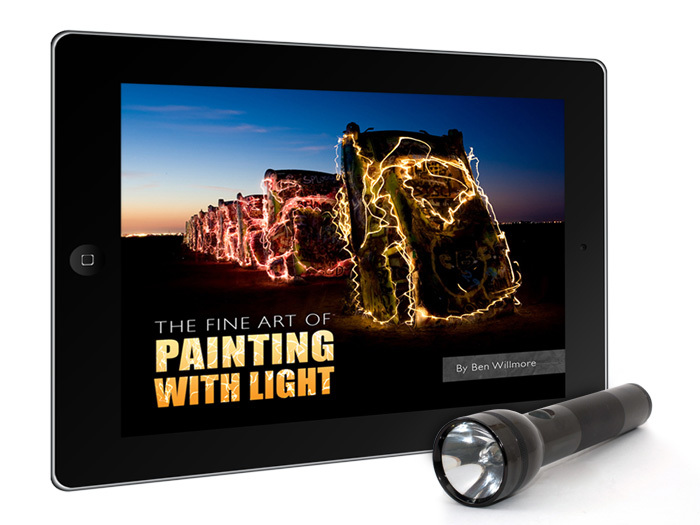 In this visually-stunning e-book, Ben reveals the secrets behind his beautiful light-painted photographs. Learn how to make your own light-painted images and take your creativity to a whole new level! In his 94-page e-book, "The Fine Art of Painting with Light," Ben Willmore covers this unique form of photography in stunning detail. The book is a comprehensive guide, starting with your very first lightpainting and moving through to advanced techniques and post-processing in Photoshop. It includes a guide to the tools required, examples of different lightpainting styles and how to achieve them and 28 real-world examples where Ben demonstrates how he created specific images. The e-book is separated into two distinct sections. The first teaches the process of lightpainting and the Photoshop post-processing skills, and the second breaks down specific images and shows how they were made. If you've never picked up a flashlight to lightpaint before, this book will give you the confidence to get started and the step-by-step guide to creating your own stunning images.